The ocean; it’s full of beautiful fish, plants and houses some of the largest ecosystems found on the planet. These ecosystems are created by coral reefs. Think of coral reefs as the Manhattan of the sea! Without healthy oceans, there’s no healthy planet and without a healthy planet, there is minimal life for humans. It’s crazy to think our ocean’s ecosystems are being diminished by our commercialism of the ocean while destroying our lifeline to a healthy planet. 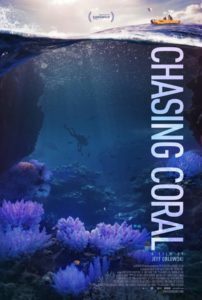 “Chasing Coral” is one of the most alarming and astounding documentaries to hit Netflix this summer. From the creators of “Chasing Ice,” the Netflix original documentary, ‘Chasing Coral,’ highlights the aggressive rate at which some of the world’s biggest and smallest reefs are dying. Many don’t think of what lies beneath the ocean surface, because it is out of sight, therefore: out of mind. Coral is an integral part to the health of the ocean and the ocean’s ecosystems. Remember the movie ‘Finding Nemo’? Remember how bright, pretty and clear the ocean and reefs looked? If that movie were depicting real life in 2017, those beautiful colors would have faded, those vast schools of fish, rays and plant life completely gone and that crystal clear blue ocean, now brown and hazy. Over the last 30 years, the world has lost more than 50% of its coral, in turn losing a great percentage of it’s reefs. ‘Chasing Coral’s’ Richard Vevers along with his team of divers and scientists are showing the world how global climate change is causing coral bleaching and killing our oceans. Coral bleaching is when coral becomes white and skeleton-like. In reality, the white coral you see in oceans is the actual skeleton of the once bright and vibrant coral. One of the world’s most famous and sought after scuba diving destinations, the Great Barrier Reef, is vanishing at a rate faster than ever before. ‘Chasing Coral’ shows us that in just a few years, most of the world’s corals and reefs will be gone if something isn’t done. Richard Vevers says, “Us losing the Great Barrier has got to wake up the rest of the world.” ‘Chasing Coral’ is distressing, unsettling and extremely saddening. It will make you feel for the world in a way you might have never felt before. It’s an upsetting documentary, but it’s the truth and the reality of what is happening to our planet and what the human eye cannot see.